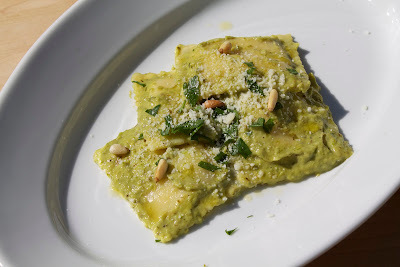 This is such an easy dish to make but will impress anyone. The seasonal roasted asaparagus adds a nutty flavor while the ravioli adds a beautiful cheesiness to this dish. The sauce is so creamy while still managing to be light. This sauce would even be tasty on a bruschetta or a piece of meat. Preheat the oven to 400 degrees. Bring a large pot of salted water to the boil for the ravioli. Trim off the woody end of the asparagus. Place the asparagus in a large baking sheet with 3 tbs. olive oil, salt and pepper. Mix all of the ingredients together so that it is evenly combined. Spread the asparagus out in a single layer. Cook the asparagus for about 10-13 minutes or until the asparagus is tender when pierced by a knife. Take it out of the oven and let it cool for 5 minutes. Chop the asparagus up and place it in a food processor. While the food processor is still running add in 1/3 cup of olive oil. Puree until smooth and add in ¼ cup pecorino romano cheese and the cream. Puree to combine. In a dry pan add the pine nuts and toast on medium-high heat. Stir occasionally until they are golden and smell delicious! This will take about 1 minute. Set aside in a bowl. Cook the ravioli according to the package’s directions. Reserve some of the pasta water in a cup and then drain the ravioli. 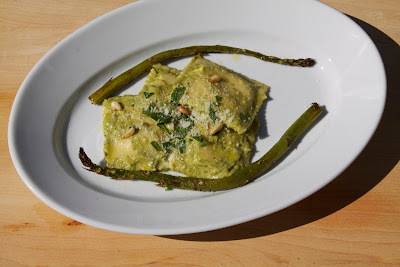 Place the ravioli in a serving bowl with the asparagus sauce and combine. Add as much pasta water as you want for a thinner consistency. Serve with the toasted pine nuts, a drizzle of olive oil, parsley and pecorino romano cheese.